The Kingdom of Praelia is Sports Reenactment. 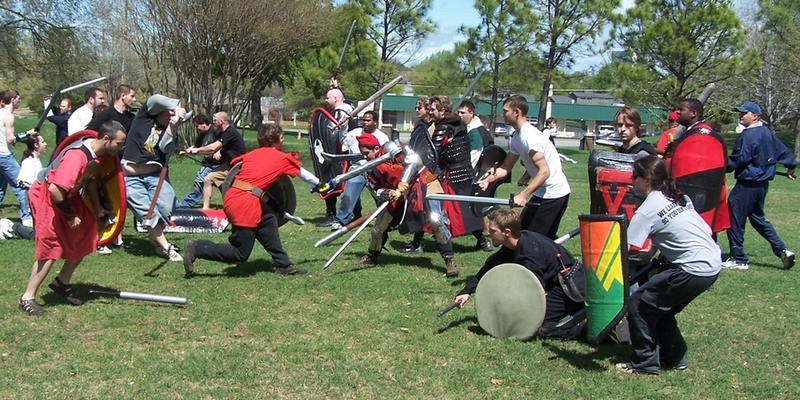 The combination of sport combat with live action role playing and living history recreation results in a group that has something for everyone. Using the Melee: Culture Crafts Combat system allows for multiple groups with various aspects of the Meleeworld to join together at larger events and play on one field under one unified set of rules. Since sanctioned events take place in the world of Alluvium, everyone's story can become part of the canon narrative. Unlike other LARP experiences, Meleeworld events on both live and table top platforms affect the world around them with the same legitimacy. Your group's lore and history joins with the history of other groups. Supplements and group specific books may also be made to spread your story to the rest of the Kingdom! The Kingdom is welcoming to many diverse groups whose individual interests may range from historical to fantasy, heavy combat to lighter roleplaying. By joining the Kingdom of Praelia, smaller groups maintain their individual identity while having the security of a larger framework to help with organization when coordinating events that include others area groups. The Kingdom of Praelia is the live action reenactment platform for the Melee series. Additionally, Melee: The Eternal Adventure takes place in the same universe. Players can take the same persona from their table top game to play in live action in the Kingdom of Praelia with ease. The Kingdom of Praelia has so many things to do that all ages can find something that excites them. Find or form a social guild that studies and promotes what you like.